Uber's app-based private taxi service makes a splash. Ganesh Ramakrishnan, 30, was hooked by Uber's private cab service from the day he first used it while on a visit to Delhi. "All rides with Uber have been exceptional," says this Mumbai-based marketing professional. The most intriguing aspect is the eclectic nature of its fleet - cabs that have arrived at Ramakrishnan's doorstep include a Toyota Camry, a Mercedes E Class and an Audi 6. "It's like a lottery," he says. Another Uber difference from the average cab service is that you cannot phone for a cab - you have to use Uber's app. Yet one more: you cannot pay cash; it has to be by credit card. The app is available for free download on iPhones and Android based mobile devices, after which you sign up with a credit card. Once you book a cab, you get a minute by minute update, of where the cab has reached all the way till the end of your journey. Finally, Uber has traveled far, but it travels light - it does not own any of the cabs it operates. It partners with private fleet owners or drivers to provide the vehicles, essentially acting as a marketplace for customers to connect with available private cars. Founded in 2009 in San Francisco by Travis Kalanick and Garrett Camp with a seed capital of $200,000, Uber has since spread to more than 100 cities in 35 countries including Bangalore, Chennai, Hyderabad, Delhi and Mumbai in India. With funding of $258 million from Google Ventures in 2013 and smaller amounts from a host of other investors, Uber is on song across the world. It has also launched a lower end service called UberX, which operates in some cities in the US, Europe and Australia. Despite the presence of luxury models among the cabs it provides, Uber's representatives prefer to call theirs not a luxury cab service but a reliable one. "Despite so many options being available, there was a gap in the market. A gap, not of options, but of reliable options," says Jambu Palaniappan, who heads expansions for Uber in Europe, Middle East, Africa and India. Allen Penn, who heads operations in the Asia Pacific region, echoes his words. "Regardless of where you use Uber, you get a reliable, convenient and safe ride," he says. With its emphasis on technology it is no surprise that in India, the service was first launched in Bangalore - a soft launch in August-end last year, followed by a full fledged launch in October. 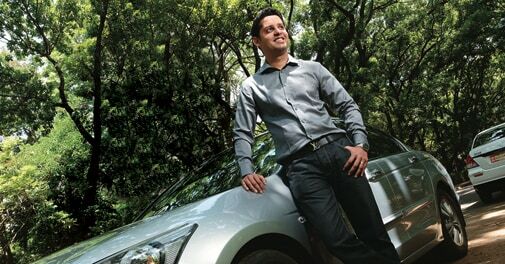 "People here are early to latch on to new technology," says Bhavik Rathod, Uber's General Manager in Bangalore. Contrary to expectations given the fancy cab models, it is not terribly expensive either. Take Mumbai, where the cabs began running in February, followed by an official launch in April. The average cab fare for a trip from Lower Parel in south central Mumbai to Powai in the northeast would be around Rs 300 to 400, while an air-conditioned cab would cost Rs 500-550. In comparison, an Uber cab's charge could be around Rs 650. "What works for many customers is that it is an on demand and cashless service," says Siddharth Siddharth Shanker, Uber's Hyderabad GM. "Uber is a good concept," says Jaspal Singh, Partner at consultancy and market research firm Valoriser Consultants. "It is probably the first to use this business model in India and is also making an effort to reach people." On polling day, for instance, it provided free rides to the polling booths. How does it help private cab operators to team up with Uber? "This is an incremental income for operators, so people who are already into the transportation business can benefit," says Penn. "The service also allows driver partners to maintain flexibility in their operations." But challenges remain, foremost among them being that the field is a crowded one. There are around 500,000 taxis in India taking both the organised and unorganised sectors, according to Valoriser's Jaspal Singh. There are the black-and-yellow taxis and operators such Meru Cabs and Easy Cabs which are already well entrenched. Ola Cabs, has also begun a luxury cab service which can be accessed through a mobile app. "But we bring in the global learning," says Palaniappan. Again, accepting payment only through credit cards may be self-limiting in a country where credit card penetration is just 1.7 per cent. But there remain diehard fans with marketing executive Ramakrishnan, who says: "Uber is catering to what I and many others like me are looking for."